Okay, so this could have easily also went into Saturday’s theme, but I felt for some reason that having it in Worldly Wednesday was more fitting. This recipe took a lot of research and was referenced to two different recipes, one vegan from the start and one not. The main recipe I want to give credit to is the recipe I based the cheese off of, http://vedgedout.com/2013/03/11/individual-vegan-margherita-pizzas-with-homemade-fresh-moxarella-cheese/. I tweaked it quite a bit because I wanted it to have a sharper flavor that tasted more like the cheese I remember from this dish and rewrote the directions based upon my own experience with making it. My entire family (none are vegan themselves) all ate it and said it tasted like the real thing. My mom (although full disclosure: has not eaten real cheese since the 90s, longer than I have abstained from it) said the texture and melty-ness of the cheese was spot on and was of excellent flavor. Blend ingredients in a good blender until totally smooth/liquid. 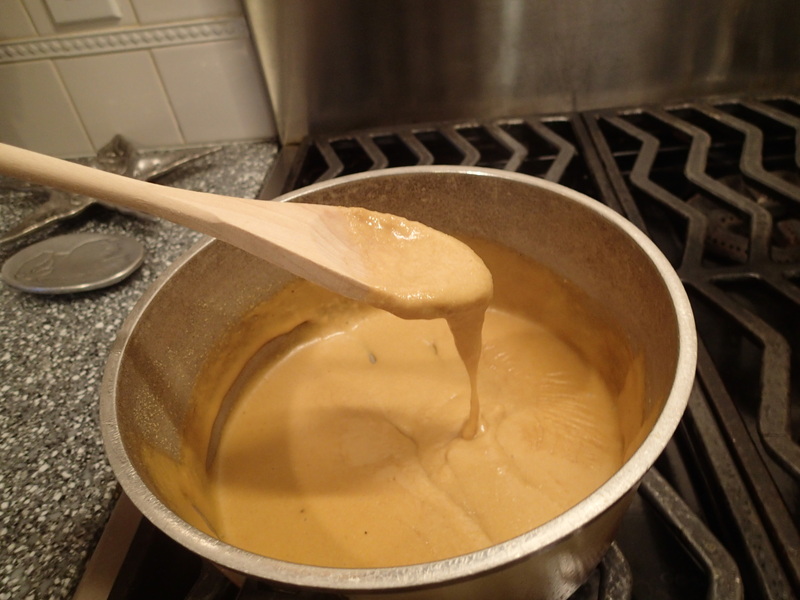 Pour into a saucepan and cook while stirring constantly on medium-high heat. Set aside or place in the fridge when cool for use a bit later when the rest of the soup is done. In a large soup pot over medium heat, melt the stick of Earth Balance. Add the onions, garlic, bay leaves, and thyme sprigs and cook covered for about 20-25 minutes until the onions are browned, soft, and caramelized. Check about every five minutes or so and stir gently to make sure it doesn’t start to burn. Add wine, boil, and reduce the heat to simmer until the wine is mostly evaporated and the onions are somewhat starting to dehydrate. Leave the pot uncovered for this step. This will take at least 10 minutes, maybe longer. Add the flour and stir. Reduce the heat and cook for about 3 minutes or less if the flour really starts to stick to the bottom of the pot. Add the vegetable broth and stir the contents of the bottom of the pot to deglaze the flour and onions stuck to the bottom. Bring to a simmer and cook for at least 10 minutes. Add pepper and/or salt as desired. Don’t be tempted to add too much salt as the salt in the vegetable broth should be enough (unless you bought a salt free brand). I just added 1/2 tsp black pepper, you might like more or less. Place the baguette slices on a baking sheet, spray both bottoms and tops with cooking oil, and place a good sized dollop of the cheese (about 2 tbsp) on top. Broil for 3-5 minutes watching and checking quite carefully. Don’t let making the soup distract you because you could easily burn them beyond recognition if you don’t. 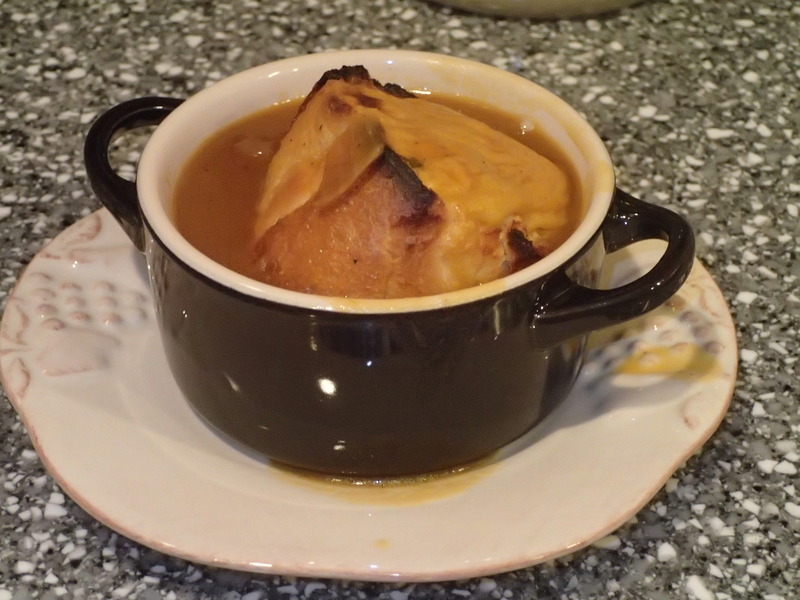 Place soup in bowls or pretty ramekins and place the croutons on top of the soup, allowing the soup liquid to seep into the bread. If you have any leftover cheese, it might be a great idea to add a bit more to the soup and float it around for more of that gooey, stretchy, deliciousness.